Romance Novels Set in Italy — Isn’t It Romantic? 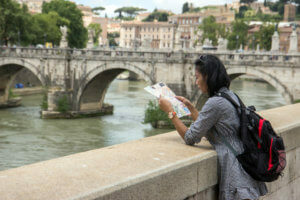 Have you read any romance novels set in Italy? 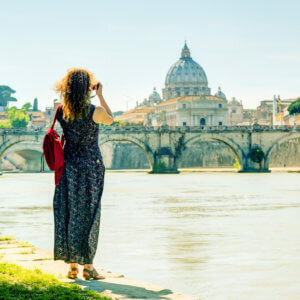 Hard to imagine a more delicious setting for love to blossom — the friendly climate, the warm people, the food, the passionate way Italians live. And while you’re dallying with a (fictional) handsome Italian, you’re munching on fabulous pasta and looking at gorgeous art. Longing for a romantic book like that? I have a list for you, below. Romance in contemporary Italy? 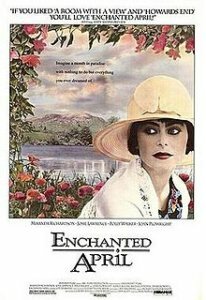 One of the most enchanting novels set in northern Italy is Elizabeth von Arnim’s magical The Enchanted April. Four women in 1920s England who are dissatisfied with their loveless lives set off for a month’s sojourn in a medieval castle in Portofino. The story, called “a sun-washed fairytale” is about love in many different forms. Not the least is the love that grows between these strangers-turned-companions. Several romances blossom during the enchanted month. And the writing is as magical as the setting. If you don’t happy-cry at the end, then we can’t be friends. The movie is one I own, and recommend buying if you, like me, enjoy a good happy-cry. Another great romance novel set in Italy takes you back to medieval Siena. Melodie Winawer’s debut travel novel, The Scribe of Siena blends a love story, art and history, and a mystery. It takes a modern-day female neurosurgeon back in time to arrive just before the Black Death devastates Siena. She finds herself in a race to uncover a 700-year-old conspiracy and to save the artist she has fallen in love with. If you love detailed historical and romantic fiction, you’ll love this one. 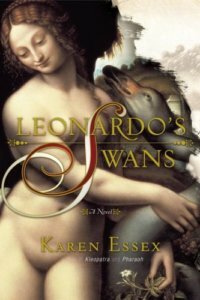 Leonardo’s Swans by Karen Essex is a vivid, romantic historical novel set in Renaissance Italy. The main characters are sisters Isabella and Beatrice, who each have a relationship with Leonardo da Vinci. The setting is vivid, the characters well drawn and the story full of adventure, romance, ambition, heartbreak, and love. 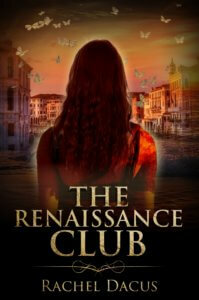 Of course, there’s also my novel, The Renaissance Club, a time travel romance set in Italy. It brings together a 17th century artist and his super-fan from another time, for passion and love. It’s perfect for fans of Susanna Kearsley and Diana Gabaldon. 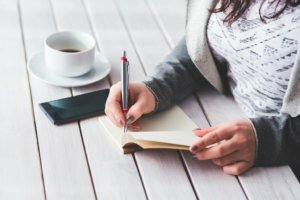 My name is Aly and I would like to know if you would have any interest to have your website here at racheldacus.net promoted as a resource on our blog alychidesign.com ?